With DigitalOcean’s simple interface with API access, and full root level access, here is a great opportunity to create an automated setup that scales itself on-demand. You can have your websites scale up or down automatically to meet the traffic demands. Both vertical and horizontal scalability is possible with this API, which can be accessed with just a bash script. It is best to create an admin droplet which has its public key on all other droplets. This would allow you to push webpage updates with rsync, as well as issue commands to other droplets, and query them for Nagios, NRPE, and SNMPD vitals. You would need to create your own level of logic to determine how and when you wish to scale things – for example if a server reaches 85% CPU usage, double the RAM (vertical scaling) or create a clone (horizontal scaling). The choice is a price-benefit analysis and is left to the reader. # Be Sure To Change This! echo "Spinning up a new droplet $Droplet_Name"
echo "Resizing a droplet ID: $Droplet_ID to Size ID: $2"
echo "Taking a snapshot of Droplet $1 with Name: $Snapshot_Name"
# Display all current droplets. Region_ID: 1 for US, 2 for Amsterdam. echo "Possible droplets sizes by RAM:"
Suppose we have created a webserver droplet that has the Nginx/Apache/Memcached stack with Nagios, NRPE, SNMPD configured. Our admin droplet’s SSH key in /root/.ssh/authorized_keys and iptables rules in place, only allowing admin droplet to connect via SSH. The domain being hosted is domain.com. Recently DigitalOcean has upgraded to SSD drives, and the smallest droplet comes with 512MB of RAM and 1 CPU core. The next step up is 1GB of RAM and 1 CPU core. You can run Nginx on backend with PHP-FPM handling PHP requests, and Varnish cache in front of Nginx. Benchmarks of Varnish cache with Nginx and PHP+FPM reveal 420 requests/second compared against 22.25 requests/second served by Nginx and PHP-FPM alone. As far as droplets are concerned, there is also an interesting concept of a self-replicating VM. A host can be self-aware of being ‘overloaded’ and decide to clone itself and add the clone into DNS rotation. There are many ways of implementing this, and simplest way would be to use SNMPD and Nagios for polling data. You can even setup an orchestration VM that has its public key on all VMs. A level of automation depends on your imagination and desire for complexity. Having essential monitoring tools like Nagios, SNMPD, NRPE, and your SSH keys on the droplet that you are cloning is important. It will allow you to sync new content to this server down the line, further automating the process. You can setup an admin droplet to which you’ll upload webpages and from which all syncs will be done with a crontab. This admin droplet should have its key placed on all your droplets, and SSH port allowed only from that admin droplet’s IP address. Whether you choose to have an OpenVPN connection to this admin droplet is up to you. 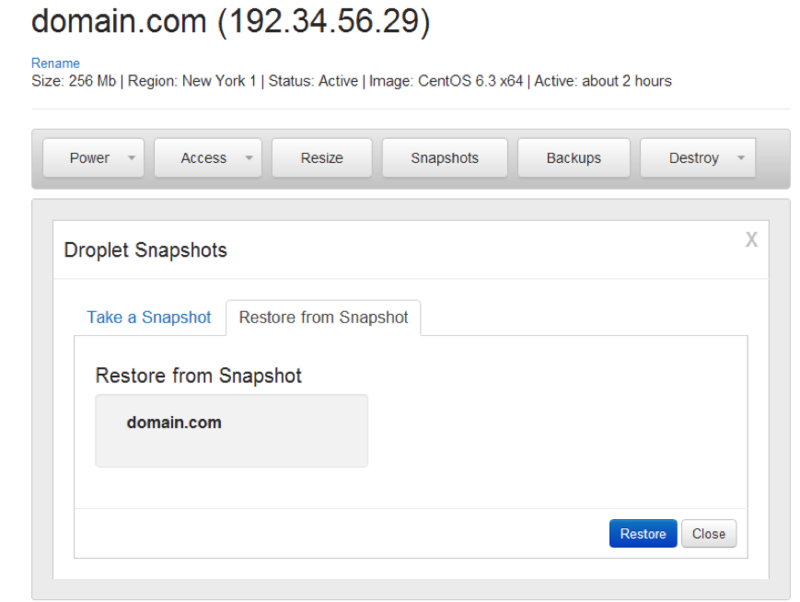 Once you have spun up your new webserver from a snapshot, you’ll need to place the server into rotation. This can be accomplished by DNS round robin, Nginx reverse proxy, a dedicated load balancer setup, and so on. The choice would depend on your infrastructure needs and budget.